Starting with a detailed oversight of how the world of terrorism is moving and concluding in a demanding planning scenario this event has shown the depth of issues that must now be considered by those, like leaders of the FRS, who face this ongoing threat. Although as a nation we have been here before, I recall personally the IRA attacks at Warrington gas works and the deaths of two boys in the street and arson attacks by Welsh nationalists on English estate agents and animal rights campaigners on milk tankers (I remind Lee Howell that a such a fire destroyed the top floor fur department of a major Plymouth store), this time the scale and depth of the threat is unprecedented except in war. Responding to terrorist attacks also involves complexities for command and organisation and it has been very reassuring to learn of the planning and thought that already exists perhaps tinged with a little disappointment that only a few FRS are here to discuss and learn. A key resilience issue for me is the growth in vulnerability in our European society as we pursue the advantages of advancement through technology and infrastructure. For example as we have built a great deal of our future on integrated transport utilities and social media, which if lost - through denial of access however caused be it power loss or cyber-attack - leave us extremely exposed. My own research reinforces a view that we have to address not just the immediately recognisable hardware and planning of response but the less visible and sometimes more fragile matter of community and individual resilience; to convince and turn citizens from believing and acting as victims into powerful responders, so we use everyone’s abilities to meet this threat. That’s not an easy task as risk is personal – how each of us acts under threat is conditional on how as an individual we perceive and consider risk – obvious if you live below a big dam that might burst less so on Westminster Bridge. And it strikes me that the FRS is well placed and knowledgeable on how to consider, engage and undertake that task. I say that because the FRS experience in community fire safety demonstrated that improvements can be made and sustained. 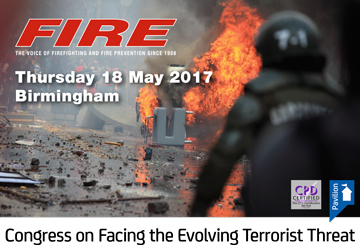 In the past it was about getting fire deaths down but that work illustrates how well the FRS understands vulnerability at the individual and community level and, because the FRS also recognises that all situations cannot be pre-planned, its overall approach to tackling novel and unpredictable events puts it in a good place to manage what may be extreme consequences. We also need to rethink and change our philosophy towards risk. Our current risk approach has been developed from a health and safety perspective – yet what we now face is a different and daunting challenge – which I believe needs fresh thinking. Today’s risk paradigm of likelihood and impact drives mechanistic political decisions about investments offering some certainty about lowering risk to acceptable levels. My view is that needs to change so we better address these issues of vulnerability and expanded consequence in a different way. One that offers politicians and planners new tools that inspire confidence to invest not just in the hardware of response but in the ‘softer skills’ which really do build resilient societies; societies that engage and empower citizens; societies that are alert, gain mutual aid skills like first aid and CPR, and are above all sufficiently aware and prepared to know how to help each other when bad things happen. We must try to remember the very first and last responder will always be an individual citizen. This extremely informative and useful congress has helped clarify the challenge and exposed the complexity of meeting the threat posed by terrorism and is a credit to all the speakers and participants.